Zeno Schumacher, Yoichi Miyahara and Peter Grütter from McGill University, Montreal together with our colleague Laure Aeschimann from NANOSENSORS™ are showing in their current publication “Improved atomic force microscopy cantilever performance by partial reflective coating” (Beilstein J. Nanotechnol. 2015, 6, 1450–1456) the advantages of partial coated AFM cantilevers. Force noise of cantilevers with different coating coverage percentages measured in high vacuum. From: Beilstein J. Nanotechnol. 2015, 6, 1450–1456. Beside the close-to-original Q-factor of partial coated cantilever a reduced low-frequency noise is the second big advantage of a partial coated cantilever. 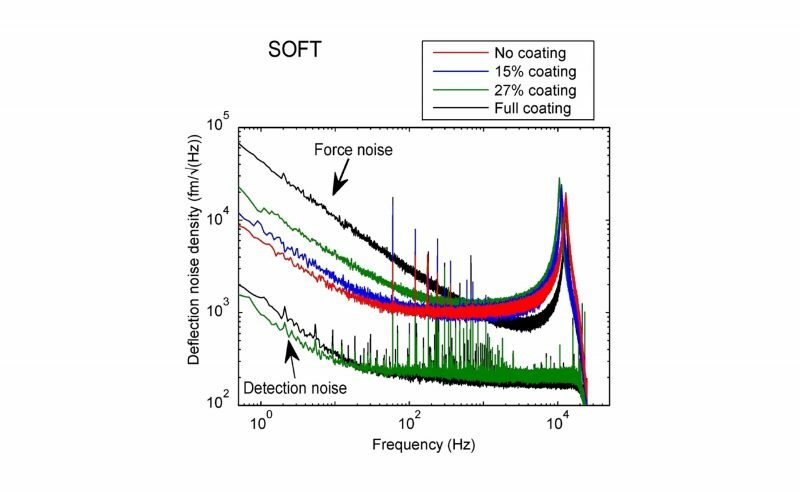 The figure is showing noise spectra of soft cantilevers with different coating coverages acquired in air. The fully coated cantilever shows the highest 1/f noise. The 1/f noise reduces with reduced coating coverage. The uncoated cantilever shows the lowest 1/f noise level. When comparing the fully coated with the uncoated cantilever a difference of an order of magnitude could be observed. This reduced force noise will enhance the cantilever sensitivity for contact mode imaging and force spectroscopy measurements dramatically. 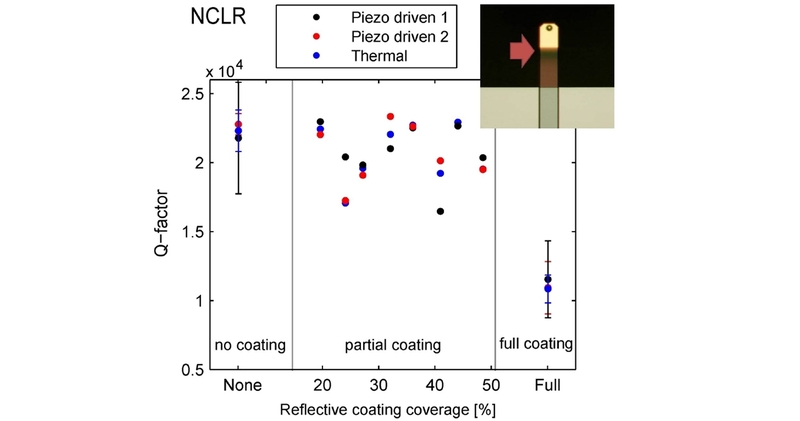 Zeno Schumacher, Yoichi Miyahara and Peter Grütter from McGill University, Montreal together with our colleague Laure Aeschimann from NANOSENSORS™ are showing in their current publication “Improved atomic force microscopy cantilever performance by partial reflective coating” (Beilstein J. Nanotechnol. 2015, 6, 1450–1456) the advantages of partially coated AFM cantilevers. Q-factors of NCLR cantilevers with different coating coverage percentages measured in high vacuum. From: Beilstein J. Nanotechnol. 2015, 6, 1450–1456. They coated cantilevers with coating coverages from 15 to 100% and measured low-frequency noise and Q-factors. In the graph above shows the Q-factors of NCLR cantilevers with different coating coverage percentages measured in high vacuum. A 30 nm Al coating was added to a 7 μm thick NANOSENSORS™ NCLR cantilever. Adding a complete reflective coating to the cantilever will reduce the Q-factor by half compared to the uncoated cantilevers. By minimizing the coating to 20% of the cantilever length the same Q-factor as that of the uncoated cantilever can be achieved.